Funny photo booth with sticks can be used in multiple occasions such as wedding shower, reception, engagement party, bridal shower, prom, birthday, bride and groom parties,graduation event, anniversary, retirement and any other festival parties or happy occasions. 【Bachelorette photo booth props easy assemble is needed】Simply attach the included bamboo dowels to each Foil metallic rose gold photo booth props using the pearl beads glue and 3M adhesive tabs(usage refer to the image), Then hold the prop in front of your face, over your head, etc. take a photo what you want anytime, anywhere. 【Wedding photo booth props for him her】Highly recommended assemble this bachelorette gifts photo booth in advance, place hen party props in a mason jar as a fun table decoration until guests are ready to use.everyone will love the funny faces on these bridal shower photo booth props. Take entertaining and bachelorette party photos of your friends and family while making memories with these stylish photo booth props! 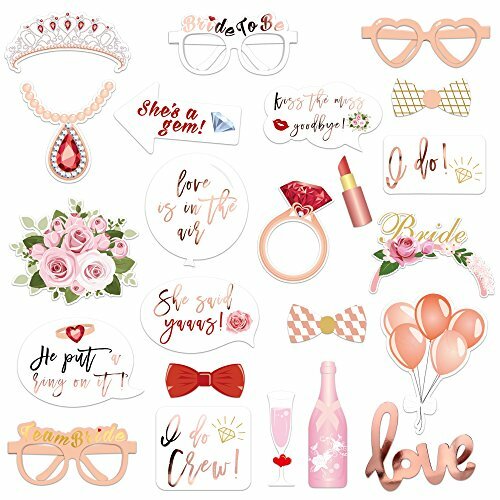 【Engagement party accessories gold metallic supreme print party supplies decorations】Bride to be Girls night out metallic rose gold decorations, unique design and fashion style. Make many fun ways to use these cute photo booth props! Everyone will loved them and the funny sayings! 【Buy with confidence】Any defective please email us for refund or replacement, we commit to provide 100% shopping experience for you. More wedding bridal shower bachelorette party favor item please visit Konsait storefront,enjoy it just add it to cart!